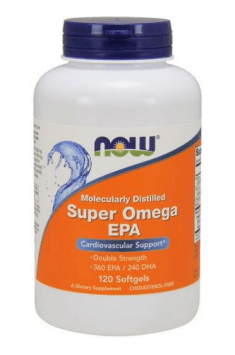 Now Foods Super Omega EPA is a product containing eicosapentaenoic acid (EPA) and docosahexaenoic acid (DHA), belonging to the group of polyunsaturated fatty acids ω-3. The majority of studies prove their anti-inflammatory properties, positive influence on the cardio-vascular system and the improvement of the functioning of people with psychological disorders. Omega-3 acids regulate, i.a. the concentration of cytokines, whose increased level in the organism is conducive to developing autoimmunological diseases, arteriosclerosis, chronic inflammations and cancers. They also demonstrate positive influence on the circulatory system, blood supply to the brain and nerve signal transmission. They reduce the risk of heart arrhythmia, stabilize blood pressure and counteract disorders in cholesterol transformations. The results of many studies proved that they play an important role in the development of the nervous system during fetal life and in early childhood. Polyunsaturated fatty acids from the family omega-3 are not synthesized de novo in the human organism, therefore they need to be provided to the organism with food. The main source of long chain fractions of omega-3 fatty acids (EPA and DHA) is fat coming from fish and sea animals. The modern diet does not cover the organism’s needs for proper amounts of healthy fatty acids, therefore it is believed that omega-3 EPA and DHA should be supplemented. We should remember about the proper proportion between the provided omega-3 acids and omega-6, which should be 1:4 – 1:5. It has been proven that the excess of omega-6 acids in a diet decreases the metabolism of omega-3 fatty acids, which may impair the structural balance of the biologically active compounds synthesized from them. Standard European diet provides too much of omega-6 (plant oils, peanuts) in relation to the supply of omega-3. In order to achieve the proper proportion between these fatty acids, supplementation may turn out to be indispensable and with this aim you may use the product Now Foods Super Omega EPA. Excessive intake of omega-6 fatty acids is believed to be unfavorable, especially with the low consumption of omega-3 acids. Eicosanoids developed from arachidonic acid (ω-6) have high biological activity even in very small amounts and in excess they stimulate inflammatory, thrombotic and allergic changes as well as cell proliferations (also cancer cells). Eicosanoids produced from omega-3 fatty acids demonstrate much gentler effect and protect the organism from the undesired effect of the increased activity of eicosanoids which are developed from omega-6 fatty acids. EPA is a precursor to eicosanoids synthesis, exhibiting anti-inflammatory and antithrombotic effects, limiting the processes of tumorigenesis and excessive blood vessels contractibility. The influence of omega-3 fatty acids on the organism is multidirectional. Providing the organism with their proper amount affects the reduction of the appearance of many civilization diseases, such as obesity, coronary artery disease and coronary heart disease, arteriosclerosis, diabetes type II, cancers, allergies and depression. Omega-3 fatty acids reduce plasmatic concentration of triglycerides by inhibiting their resynthesis and influence normalization of blood pressure. Their antithrombotic effect stems from the prolonged time of bleeding, which is caused by reducing the vulnerability of platelets to conglomerate because of inhibiting the synthesis of strongly prothrombotic substances. Antiatherosclerotic properties stem from the modification in eicosanoids synthesis, reduction of cholesterol level in plasma and inhibiting platelets adhesion. It has been proven that low level of omega-3 and high level of omega-6 in phospholipids of skeletal muscle cell membranes is connected to the growth of insulin resistance, which is conducive to the development of diabetes type II. Thanks to inhibiting lipogenesis, the intake of omega-3 fatty acids counteracts obesity. Anti-inflammatory and anti-allergic effect of omega-3 fatty acids consists in inhibiting excessive immune response and reducing the severity of virus and bacterial inflammation processes. Antidepressant properties stem from their positive influence on the proper functioning of nerve cell membranes of the cerebral cortex. Moreover, omega-3 fatty acids show positive influence on skin and therapeutic activity in the case of skin disorders (e.g. atopic dermatitis). DHA is an essential structural component of very active nerve tissue. It constitutes even up to 60% of the sum of fatty acids is neuron phospholipids and plays an important role in the development of the nervous system, which takes place during fetal life and in the period of early childhood. Insufficient level of DHA in the diet of pregnant women causes shortening pregnancy time and low birthweight of children. DHA deficit in infants contributes also to lowering visual acuity and learning abilities at older age and in extreme cases it may disturb the process of nerve cell mineralization and conduce the appearance of mental underdevelopment. DHA synthesis dropping with age may influence the functions of the nervous system in elderly people. Summing up, Now Foods Super Omega EPA is a dietary supplement that will fill quality deficits of every diet, which is poor in polyunsaturated fatty acids omega-3. The preparation is recommended especially to people who eat too little amounts of oily sea fish and those burdened with high risk of the development of popular civilization diseases. 2 capsules a day can be effective in complementing the deficiencies of omega-3 acids in healthy people. In case of greater deficiencies, especially in the diet poor in fishes and seafood, such dose can be too small. According to the research, you should take at least 2 g of EPA + DHA to achieve significant benefits, and in case of people with coronary heart disease or atherosclerosis the dose should be higher, 3–6 g. The experts demonstrate that using higher doses of EPA + DHA, amounting for 5 g a day, is safe and does not cause any negative effects. Special attention should be drawn to the fact that the best EPA/DHA relationship showing optimal effects is 3:2 and such a relationship has been used in the supplement. Softgel Capsule (gelatin, glycerin, water) and Vitamin E (as natural d-alpha tocopherol). Contains fish (anchovies). Natural d-alpha Tocopherol from non-GMO soy. Active on many glucose metabolism pathways; helps to regulate blood sugar levels.